God’s holiness and justice require that sinners be eternally separated from Him. To be cut off completely and eternally from that Love for which one was created will be to burn with a thirst that will only grow ever more unbearable. God, however, graciously and freely offers salvation from that most dreadful condemnation. “The gospel of God’s grace” declares that God became a man through virgin birth, that this sinless God-man died for our sins, satisfying His own justice by suffering the eternal punishment we deserve, resurrected the third day, and that all who believe in Him are forgiven and receive eternal life as a free gift. Salvation is that simple—and wonderful—and must be preached in that simplicity. ). This truth must grip evangelicals once again! Contrary to popular belief, expertise in preaching (the “homiletics” taught in seminary) cannot help but hinders communication of the gospel. Proficiency in public speaking or in the latest salesmanship techniques may be helpful in a secular profession but not in “the foolishness of preaching.” Unless such methodologies and capabilities are laid aside to proclaim God’s truth, they obscure the gospel. Though the above may sound like an extreme and anti-intellectual view, such was the teaching and practice of the Apostle Paul. A learned rabbi, Paul was no doubt an eloquent orator who could sway any audience. In preaching the gospel, however, he deliberately laid aside “excellency of speech” (1 Cor:2:1) and carefully avoided “the words which man’s wisdom teacheth” (v 13). Knowing that his own ideas, embellishments, and persuasive abilities were hindrances rather than helps, the great apostle stood before his audience “in weakness, and in fear, and in much trembling” (v 3). So must we. ). Many well-meaning Christians, however, do exactly what Paul avoided, convinced that the gospel and the Holy Spirit need the help of scholarship, psychological persuasion, and modern promotional packaging. Consequently, the faith of many believers today stands upon the wisdom of men instead of in the power of God—and can thus be undermined by human argument as well. The terms “spiritual” or “spirituality” legitimize much error. “Spirituality” is now evidenced by ecumenism and enhanced by New Age techniques. Christianity Today ( CT ) (11/8/93) favorably reports upon an apparent widespread movement toward spiritual maturity. Unfortunately, in its promotion of modern “spirituality,” CT touts Richard Foster and his “contemplative prayer” techniques, which involve passivity and visualization taught by such occultists as Ignatius of Loyola (founder of the Jesuits) and Agnes Sanford. (See The Seduction of Christianity and Beyond Seduction .) Several articles uphold Roman Catholicism as sound Christianity. Introducing a major article, CT ’s executive editor praises Roman Catholic mystic Thomas Merton as having led the way into a deeper relationship with God, even though Merton, a New Ager, rejected the gospel, without the acceptance of which one cannot know God. It is not methodologies or techniques but truth and love that establish and mature spiritual life in the believer. Nor can genuine love of God and others spring from anything but acceptance and appreciation of the gospel (1 Jn:4:19). That “old, old story” reveals God’s love. Those who preach it in truth must be motivated and empowered by that same love. —applies equally to every Christian, past, present, and future. That fact is clear from Christ’s words, “teaching [converts] to observe all things whatsoever I have commanded you” (Mt 28:20). Christ’s original disciples were to teach their converts to obey every command He had given them—including preaching the gospel and teaching their converts as well to obey Christ’s every command. And so down to us today. We also must obey all He commanded the original twelve. These words of Christ correct a number of popular errors, such as the idea that His teachings in the four Gospels are only for Israel, or only to be obeyed in the Millennium, and thus are not for the church today. Also eliminated is the idea that “the gospel of the kingdom” that Christ and the disciples preached prior to the Cross is somehow different from the gospel we are to preach today. And a major source of Roman Catholic error—that the pope is Peter’s successor and that only the hierarchy of priests, bishops, cardinals, et al., are the successors of the other apostles—is also proved false. Every convert to Christ is both commanded and empowered by the Holy Spirit to obey everything Christ commanded the original twelve and thus to act in every capacity for which He trained and commissioned them. The gospel is the only solution to sin’s destructive effect in daily life. Yet even many evangelicals have lost their faith in the power of the gospel and imagine that something else is needed, be it enticing programs, psychological counseling, or new revelations from modern prophets. Paul referred to “the foolishness of preaching” because the simple gospel he preached was despised. So it is in our day. In contrast to the simplicity and purity of the gospel presented in Scripture, new methods and innovations are being employed today. 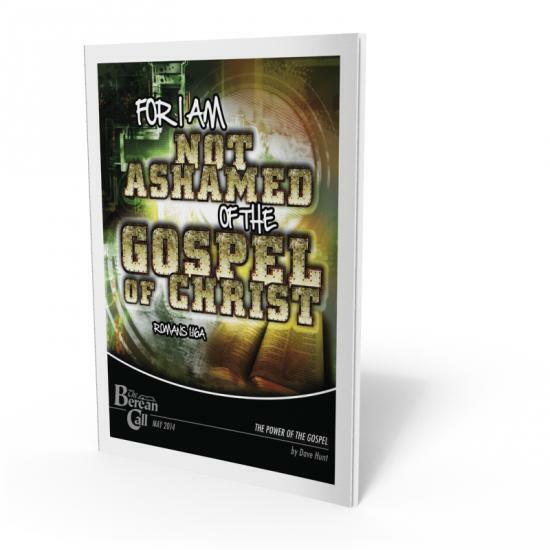 The gospel is no longer thought to be sufficient in itself. It is now taught that believing the gospel may leave a host of demons hiding within, left over from past sins or even prior generations. The Bible calls the one who believes the gospel “a new creature” in Christ for whom “old things are passed away [and] all things are become new” (2 Cor:5:17; Gal:6:15). In denial of this clear truth, “deliverance” ministries have sprung up to cast demons out of Christians. The consultation was sponsored by the Sentinel Group (SG) of Lynnwood, Wash., and drew 130 invited pastors, lay leaders, and missionaries from 30 states and provinces....The ‘growing influence of new and powerful spiritual forces on the continent’ necessitates such research, said SG President George Otis, Jr., who is also co-coordinator for the United Prayer Track of the AD 2000 and Beyond Movement.... A Spiritual Mapping Field Guide distributed at the conference outlined ways participants could prayerfully research the social bondages, allegiances, and spiritual barriers of their respective communities. It included 200 discovery questions, methodological cautions, and networking recommendations. SG’s Lisa Otis told NIRR that the research methods include interviews, observation, library backgrounding, and prayer logs. The group has planned seven regional meetings in hopes that results will help develop effective prayer and evangelism strategies. Questions immediately arise. New spiritual forces? Is there a new breed of demons more clever or powerful than those faced by the early church? If the gospel needs such help, why doesn’t the Bible say so? Why weren’t these methods taught and practiced by Christ and the apostles? How could Paul have “turned the world upside down” (Acts:17:6) through evangelism of the pagan Roman Empire without employing these techniques? Would Paul have been even more effective had he used “spiritual mapping” and employed the new “methodology for discovering specific barriers to soul-winning”? Surely Corinth, Greece’s most splendid and prosperous city, the mecca of trade between East and West, was as enslaved by Satan as any city today. The cult of Aphrodite, goddess of love and beauty, whose mythic example encouraged sexual promiscuity and perversion, had long flourished there. When Paul arrived in Corinth about A.D. 50, the massive, columned Temple of Apollo had for 600 years dominated the commercial center of the city (where much of the meat sold for consumption was first offered to idols). Yet we find no hint that Paul engaged in “spiritual mapping” of Corinth’s demonic powers. He relied solely and entirely upon the gospel to rescue pagans from Satan’s clutches: “I determined not to know any thing among you, save Jesus Christ, and him crucified” (1 Cor:2:2). ). He gave no hint, however, that these demonic powers should be mapped or tracked or that psychological techniques for dealing with multiple personalities should be employed. The believers were to stand fast in the faith, clothed in the armor of God, their sole weapon “the sword of the Spirit, which is the word of God” (v 17). The “old, old story of Jesus and His love,” as the classic hymn says, “is ever new” and best loved by “those who know it best.” We will never advance, even in eternity, to a higher spiritual experience or understanding than that produced by faith in the simple gospel that saves us. That God loved us so much as to become a man and, though hated, rejected, despised, and crucified, died in our place to reconcile sinners to Himself will ever be, for ransomed souls, the wellspring of love, joy, and worship in heaven. In all eternity we will never have a newer or better song than the “old, old story,” which is ever new. “Thou art worthy...for Thou wast slain, and hast redeemed us to God by thy blood” is the highest praise possible for the redeemed in God’s presence (Rv 5:9). Herein lies the secret of joy for those who inhabit heaven! Why are some Christians depressed, insecure, selfish, earthly minded, and lacking love, joy, peace, and victory in Christ? The “old, old story of Jesus and His love” has become old indeed to them, neglected and forgotten. They don’t need psychological counseling but a return to their “first love” (Rv 2:4). We need to meditate unceasingly upon this most wonderful truth, the simple gospel, which alone ignites the genuine love and sincere gratitude that we ought to continually express to our Lord. It is commendable if someone, concerned to know God better, studies Greek. However, if proficiency in that language were essential for knowing God’s Word and living a more fruitful Christian life, then one would expect the Greeks to be the most Christlike and fruitful of all people, and God would have had us all speak Greek. Surely the Greeks in Christ’s and Paul’s day knew their native tongue much better than today’s Greek scholars, yet they had as much difficulty living for Christ as anyone else. The love relationship God desires needs only a sincere, believing heart in which to grow. Question: I am concerned that debates are not profitable regarding Scripture. Could you please address the matter of debates? Question: If Christ took upon Himself the grave and the Lake of Fire, then there is no need of repentance and trusting Him for our salvation. Wouldn’t both penalties be paid in full? Question: Roman Catholic apologists...claim that the apostles' oral teaching was as authoritative as Scripture.... How do you respond? TBC Notes - Bend in Late August… You’ll Love It! Who Drove The Arabs Out Of Israel?